Panting for breath, I sat down on a rock just next to the narrow hiking trail. Watching people twice my age walk by me, I consoled myself that my plight was the cause of the high altitude and not because I was out of shape. Just as I was starting to believe this, I looked down the trail and saw a frail old lady, cane in hand, walking up the trail. It was easily one of the most humbling experiences of my life. Not that I should have been surprised, though. After all, I was in South Korea, where hiking is essentially the national past time. In fact, it isn’t uncommon to reach a mountain peak and find several businessmen in suits or a woman wearing her most fashionable heels. However, there were no suits or heels to be found on this trail. Hours from Seoul, I was with my wife and a friend on one of Korea’s most popular hiking trails going to Ulsanbawi (울산바위) in Seoraksan National Park. It was a crisp Saturday morning in autumn, a perfect day for hiking, and even though the leaves were quickly turning from vibrant hues to a more demure brown, the towering trees still retrained enough of their splendor to charm the many neon-clad hikers along the trail. 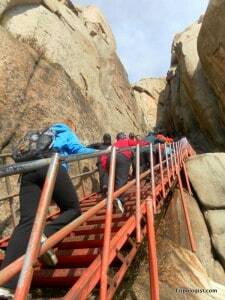 From the park entrance, a short bus ride to the west of Sokcho on South Korea’s eastern shores, it’s about 3.6 kilometers (2.25 miles) to the top of Ulsanbawi, by far the most popular hike in the entire park. The trail winds it’s way past two breathtaking Buddhist temples and through a thick forest before continuing past the tree line. While the entire trail marches uphill at a steady pace, the hardest part of the trail is the last 0.4 kilometers. Featuring over 800 steps, a staircase twists and turns up the mountainside, allowing you access to the otherwise impenetrable peak of Ulsanbawi. The reach the top of Ulsanbawi you must climb over 800 grueling stairs. However, no matter how many stairs you have to climb, the view at the top of the mountain is fantastic. Looking out at Sokcho and the sea to your west and the park to the east is mesmerizing and melts away the tired, aching muscles you’re sure to have. The next day, we did another fantastic hike along a separate trail to Geumganggul Cave (금강굴). The first half of the trail is a pleasant stroll through a wide, forested path. On the way, you’ll pass several nice restaurants and a small waterfall. Once passed the waterfall, however, the trail starts to rise through the forest climbing steeply toward the cave above. While not as long as the trail to Ulsanbawi, the trail to Geumganggul is at least as strenuous. At the end of the trail is a small cave that has been filled with a Buddhist shrine. There is even an attendant and a place for them to sleep (I’m not sure where they go to the bathroom, though). 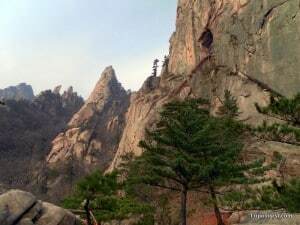 Looking out the entrance to the cave, you’re afforded a fantastic view of the many peaks of Seoraksan National Park. 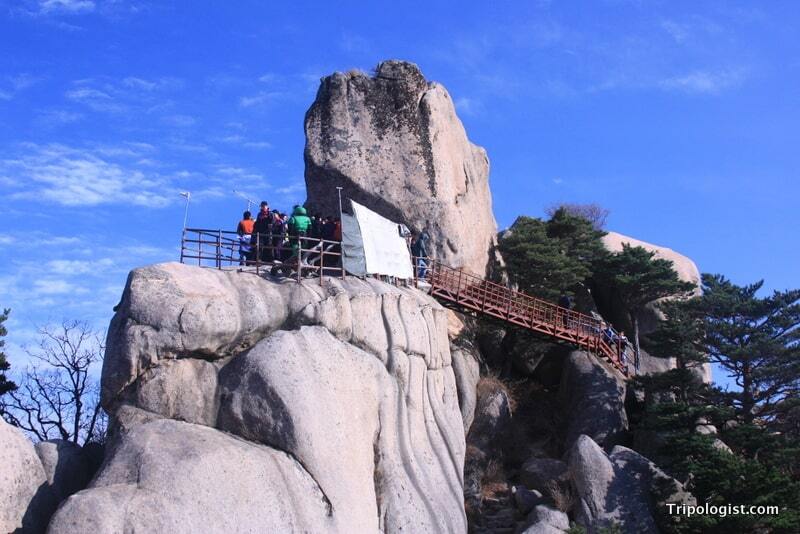 On the way down, take a break at Biseondae, a fantastic rock cliff with great views and a welcome breeze. Overall, I would highly recommend an overnight trip to Seoraksan National Park, especially during autumn. While the trails are crowded, the scerery is simply breathtaking. Geumganggul Cave, near the top right corner of the picture is reached by a tiring trail and stairwell. If you decide to stay overnight, you have two options. The first is to head back into the town of Sokcho and find a basic Korean love motel. The second option, which I highly recommend, is the spend the night in the Seoraksan Tourist Hotel near the park’s entrance. While the hotel is a normal Korean-style hotel on the inside, it features great balconies and the opportunity to spend the night in the park. If you’re an early riser, you can get a head start on the trails or check out the nearby Buddhist temple without the crowds. If you do visit on a weekend, I recommend getting a timely start to your day, as the trail gets more and more crowded as the day progresses, sometimes leading to long waits along the stairwell to the peak of Ulsanbawi. In addition to the trails mentioned, there are dozens of other trails throughout Seoraksan National Park. While some take only a few hours along flat paths, others involve crossing mountain ridges and require an overnight stay on the mountain tops. 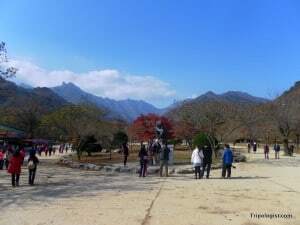 For more information about visiting Seoraksan National Park or the nearby city of Sokcho, check out the official tourism website for the city of Sokcho. The view from the entrance to Seoraksan National Park is worth the price of admission. Buses to Sokcho, in the country’s northeastern corner, can be caught from several major cities and both Express Bus Terminal and Dong Seoul Terminal in Seoul. From the Sokcho bus station, cross the street head down the road a bit to the bus stop. From there, take either bus 7 or 7-1 to the last stop, the main entrance to Seoraksan National Park. The entrance fee is 3,400 for adults. If you spend the night in the park, you will only have to pay this fee once. If you decide to stay in Sokcho, make sure that you double check when the last bus will be leaving. There are storage lockers located in several places just inside the entrance of the park. Man, that looks awesome. I bet there are a lot of great hikes in Korea although I probably would try to avoid the ones with businessmen and ladies in heels. That’s pretty funny they hike like that. Ok, well now that I’ve hiked in Korea I know you can’t avoid the business folks. I can’t wait to make it to Seoraksan. So far the best hike I’ve done has been Gwanaksan. Seoraksan is great! My favorite hike in Korea though is Namsan in Gyeongju. The hike takes you past 1,000 year old carvings and statues. Make sure you do that one at some point.